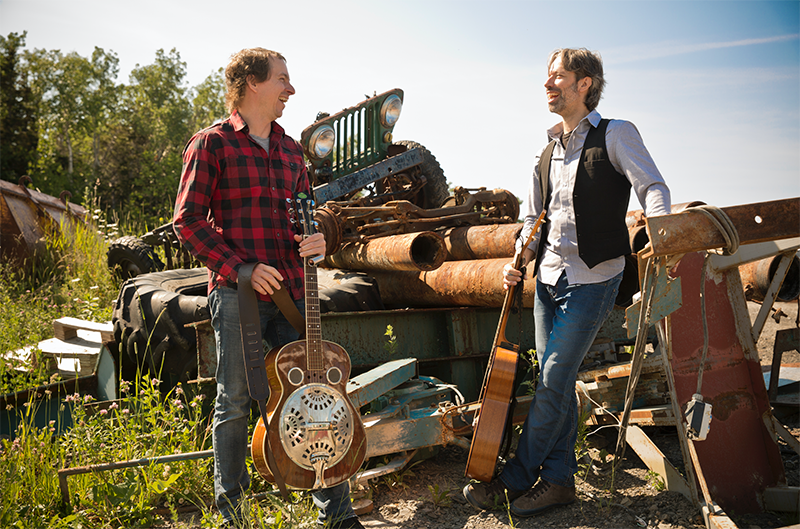 Dans l’Shed is a folk-country-blues duo from Gaspésie (QC). Mixing different instruments (guitars, dobro, banjo, lap steel) and a dynamic stage energy, Dans l’Shed is a band that knows how to catch everybody attention. Dans l’Shed is a folk-Americana duo composed by the Gaspesians guitarists Eric Dion and André Lavergne. These two friends are touring around Canada and Europe since 2014, singing about love, humour, actuality and the daily life. Their voices are smooth and charming with a hint of country-blues that hooks the public guarantee. In 2014, they were selected for the Festival en chanson de Petite-Vallée (QC) where they won the price for La chanson primée SOCAN with the song Dans l’bois and a showcase at ROSEQ. In 2015, they released Rivière Rouge, their first full length album under the label Le Grenier musique. The album was in the ICI Musique list of the 50 best albums of the year. In May 2017, at the Trille Or gala in Ottawa, the band received the price Export Québec. Every year, that distinction goes to a group from Québec that was the most present in the Canadian Francophonie. In October of the same year, Dans l’Shed released their second album: Gaspericana, co-directed by Guillaume Arsenault. With this album, the duo writes the portrait of the modern rural life with songs less orchestrate than Rivière-Rouge, with the use of different instruments to complement some parts. Gaspericana is in the ICI Musique list of the 50 best albums of the year.